Have spent as much time as possible fixing busted stuff these past few months. 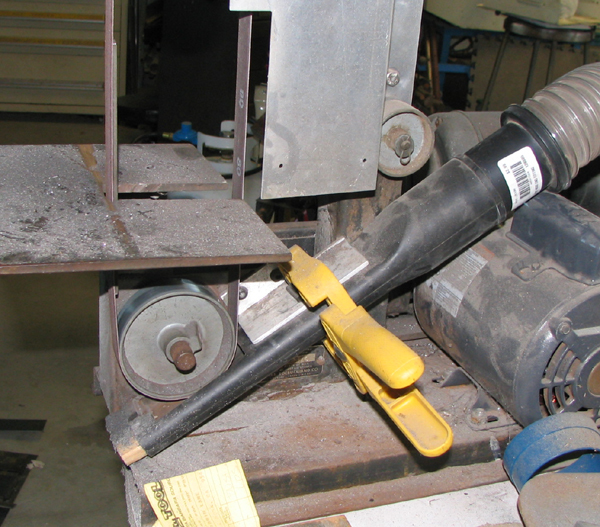 Going under the tongs were the drill press, the lathe and the shop in general, which has become a real pigpen. 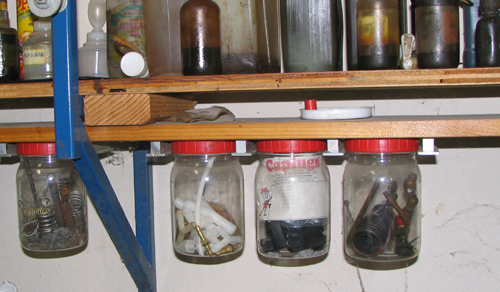 Photo #1: For those who have asked here's how I'm hanging jars of parts, using homemade hangars that attach to the bottom of any convenient surface. These were made of aluminum, many moons ago. The latest batch I made of steel, for no good reason other than it made tapping unnecessary. Photo #2: After much fruitless fiddling with baffles and ducting I settled on this, as the best scheme for sucking grinding dust out of the shop. It's nothing more than one of those flat vacuum snouts, the kind for getting under the fridge, but with a slot cut in the side and with the end plugged with a piece of wood. It fastens to an angle bracket with a quick-release clamp, to simplify belt changing. Photo #4: In progress: first of four fireball shooters which will eventually occupy the "gun deck" on my art car. 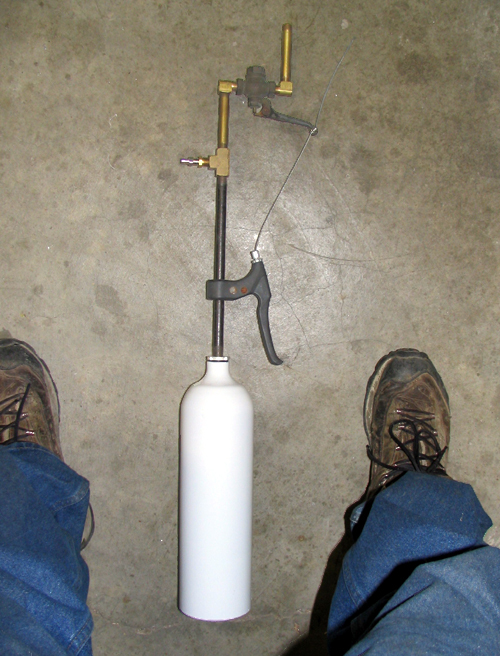 In operation propane enters thru the tee fitting and fills the white aluminum bottle which acts as an expansion chamber. 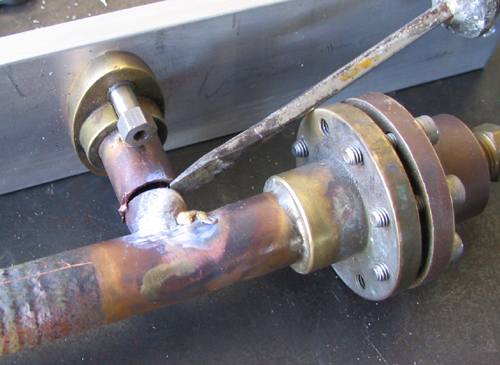 A salvaged brake handle from an old bicycle is used to activate a whistle valve atop a length of pipe. Still to be added are a piezo sparker and a "nozzle" which will be made from a stainless steel egg cup, the only off-the-shelf item with the requisite geometry.